NASA's Voyager 1 took a classic portrait of Earth from several billion miles away in 1990. 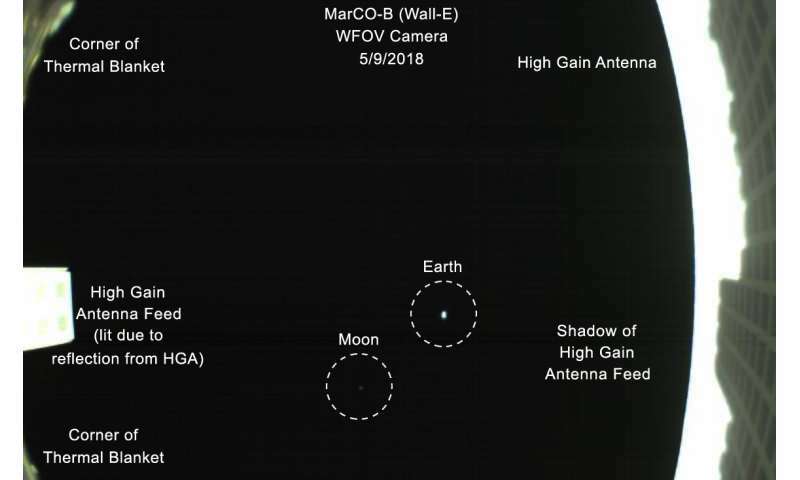 Now a class of tiny, boxy spacecraft, known as CubeSats, have just taken their own version of a "pale blue dot" image, capturing Earth and its moon in one shot. NASA set a new distance record for CubeSats on May 8 when a pair of CubeSats called Mars Cube One (MarCO) reached 621,371 miles (1 million kilometers) from Earth. One of the CubeSats, called MarCO-B (and affectionately known as "Wall-E" to the MarCO team) used a fisheye camera to snap its first photo on May 9. That photo is part of the process used by the engineering team to confirm the spacecraft's high-gain antenna has properly unfolded. 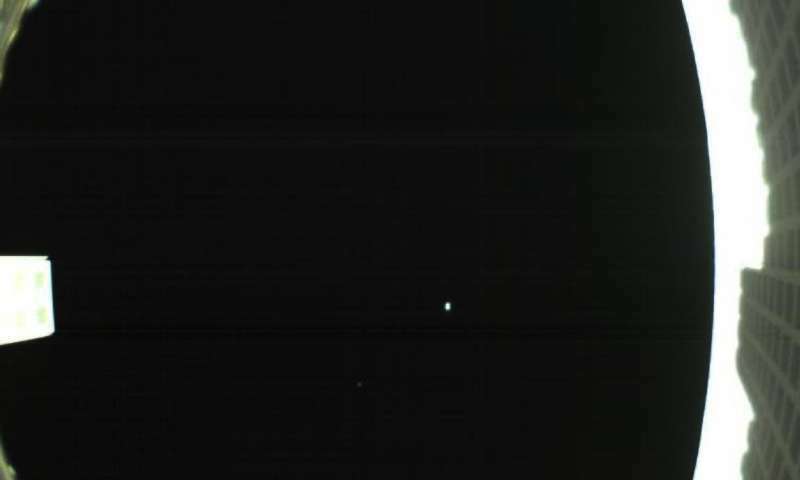 As a bonus, it captured Earth and its moon as tiny specks floating in space. "Consider it our homage to Voyager," said Andy Klesh, MarCO's chief engineer at NASA's Jet Propulsion Laboratory, Pasadena, California. JPL built the CubeSats and leads the MarCO mission. "CubeSats have never gone this far into space before, so it's a big milestone. Both our CubeSats are healthy and functioning properly. We're looking forward to seeing them travel even farther." The MarCO spacecraft are the first CubeSats ever launched to deep space. Most never go beyond Earth orbit; they generally stay below 497 miles (800 kilometers) above the planet. Though they were originally developed to teach university students about satellites, CubeSats are now a major commercial technology, providing data on everything from shipping routes to environmental changes. The MarCO CubeSats were launched on May 5 along with NASA's InSight lander, a spacecraft that will touch down on Mars and study the planet's deep interior for the first time. InSight, short for Interior Exploration using Seismic Investigations, Geodesy and Heat Transport, will attempt to land on Mars on Nov. 26. JPL also leads the InSight mission. Mars landings are notoriously challenging due to the Red Planet's thin atmosphere. The MarCO CubeSats will follow along behind InSight during its cruise to Mars. Should they make it all the way to Mars, they will radio back data about InSight while it enters the atmosphere and descends to the planet's surface. The high-gain antennas are key to that effort; the MarCO team have early confirmation that the antennas have successfully deployed, but will continue to test them in the weeks ahead. InSight won't rely on the MarCO mission for data relay. That job will fall to NASA's Mars Reconnaissance Orbiter. But the MarCOs could be a pathfinder so that future missions can "bring their own relay" to Mars. They could also demonstrate a number of experimental technologies, including their antennas, radios and propulsion systems, which will allow CubeSats to collect science in the future. Later this month, the MarCOs will attempt the first trajectory correction maneuvers ever performed by CubeSats. This maneuver lets them steer towards Mars, blazing a trail for CubeSats to come.